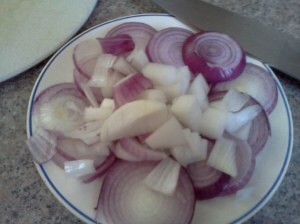 The first onions from our garden. 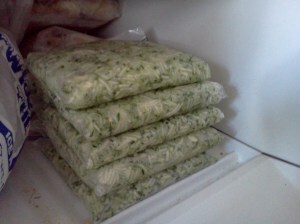 Several of our first zucchini shredded and packaged for zucchini cake this Autumn. 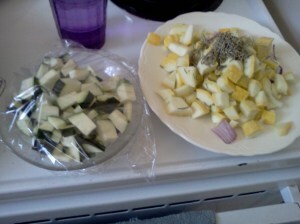 Zucchini, Yellow Squash, Red Onions, and Rosemary, all from the garden ready to saute. Cut up zucchini, yellow squash, red onions in bite size pieces. Add 2-3 tablespoons of rosemary. Mine was dried. If you use rosemary from the store, you'll have to season to taste. Melt 4 T butter in a saucepan; add veggies and stir-fry over medium until crisp tender. 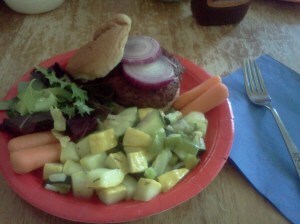 We served it with grilled burgers and salad. I will have zucchini and yellow summer squash soon. I have onions and rosemary ready to harvest in the garden. I will certainly give this a try. Thanks for sharing. I always love garden fresh recipes. I really enjoyed the rosemary. It was yummy. Thanks for commenting! Every gardener need zucchini ideas! This sounds great! Thanks for linking up to The Ease of Freeze! I love zucchini and this looks wonderful... Thanks for sharing on Foodie Friends Friday. This looks like a great zucchini recipe! Thanks for sharing on Foodie Friends Friday! this is one of my favorite summer dishes. I usually season with garlic salt, lemon pepper and basil. I'm going to try the rosemary next time. Thanks for the recipe.